What It's Like on the Inside: IRFD 2011: Are You Ready? It's late summer...and you know what that means. 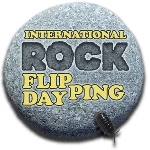 International Rock-Flipping Day (IFRD) is coming. There's nothing you can do to stop it. You just have to jump in and grab that flippin' rock with both hands and be prepared to document what lies beneath. Citizen science/naturalism never felt so good. On or about September 11th, find your rock or rocks and flip it/them over. Replace the rock as you found it: It's someone's home. Send me a link. Or you can add a comment to any IRFD post. There is a handy badge available for your blog, here. Get your family and/or students ready to flip out. Spend the week finding just the right rock and making predictions about what's waiting for you below. I'm looking forward to seeing what you share on Sunday! Thanks for posting this! I'm expecting a great rock flipping day! Always a great event. Thanks for taking on the hosting duties!